0 Comment October 26, 2017 Like? Back To Basics: JOYSTICK BATTLE! Today in Episode 23 of Back To Basics we’re going to give you a JOYSTICK BATTLE! Battle of camera control options for pan, tilt zoom cameras in particular. PTZOptics joystick controllers have many options and we got three options that we’re gonna show. The PTZOptics IP Super Controller is connected via the network, so this is how it’s going to communicate with all of your cameras that are on the network. You control the cameras with the joystick. It’s also connected to the network via Ethernet cable, so any camera that is also in the network connected via Ethernet is going to be accessible by this joystick controller. The PTZOptics IP Super Controller has camera hotkeys. Which is one of the highly requested features for the new generation of this product, so you are able to easily transition between up to four cameras. The cool thing about these controllers is they have their own IP address which is how how we can enter new cameras into this joystick. You can set and call presets just the same way that we explained with the HuddleCam joystick. You can focus and zoom with buttons or you can focus and zoom with the joystick controller. We recently figured out about this it doesn’t have a variable pan, tilt, and zoom. You can change the speed of zoom and pan The fast-forward is getting three to one to control the speed of which you pan tilt and zoom. Let’s talk about a wire connection based joystick controller, one of our best options and more popular options is the HuddleCam Controller Joystick. If we were just controlling one camera, we would be able to set presets by pressing set, whatever number that you want to set the preset to, enter, and that’s going to set your presets. You can also call presets by pressing call, and then pressing the corresponding number. The HuddleCam Controller has camera control variable pan, tilt, and zoom. Depending on how hard or soft you adjust the joystick that is how hard or soft your pan or zoom is going to be. The HuddleCam joystick is connecting to the back of the PTZOptics camera now. You see the empty cascade port in the picture above. That’s the out port, that’s what allows you to connect from camera to camera. The fancy term is daisy chaining, so that’s how you’re going to be able to access the four hotkeys on the HuddleCam joystick stick for camera control. The HuddleCam is definitely for somebody who likes the wired aspect and who’s not so familiar with IP networking, so that’s definitely a great option for you if you want a hardwired camera to camera set up for joystick control. Let’s talk about the fun one! This is something that a lot of our customers have played around with. In the episode we showed you how to program the joystick camera control’s with the Xbox controller. What’s cool about this, is that you can zoom and pan at the same time! Vmix has a built-in shortcut template for the Xbox controller and there’s a way to use Auto Hotkey in conjunction with Vmix to use an Xbox controller to control the cameras without having to use the mix active. Conclusion with our JOYSTICK BATTLE! That’s basically our joystick battle from this episode of Back To Basics. Send us a message and let us know. Tell us which is your favorite joystick. Which one do you think is the coolest. Which one is best for your particular use. New PTZ camera control functionality with our IP joystick firmware upgrade here. Overview our RS-232 Serial PTZ Joystick controller here. Learn how to access the OSD (On Screen Display) Menu with the PTZ Joystick Controller here. How to use our PTZ Camera Control iPhone/iPad App here. Skaarhoj releases new Visca over IP PTZ joysticks for PTZOptics here. Quick tutorial on how to use the IP Joystick here. PTZOptics IP Joystick product page here. PTZOptics RS-232 Serial joystick product page here. 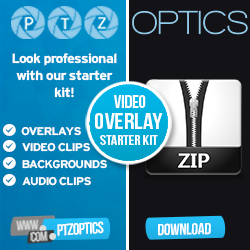 Learn more about cables from PTZOptics here. Using SONY PTZ Joystick controllers with PTZOptics cameras here. Hands on review of the SONY RM-BR300 SERIAL PTZ JOYSTICK here. How to use an XBox controller for PTZ camera control here. Our YouTube channel features live broadcasting tips, tricks and tutorials for live streaming and more. ✓ Free UDEMY Course on how we live stream here: http://ptzoptics.com/landing/coupons…. Copyright © 2017. PTZOptics® is a Registered Trademark PTZOptics.com... PTZOptics Videos are registered under the Creative Commons Licenses and can be used with proper credit.